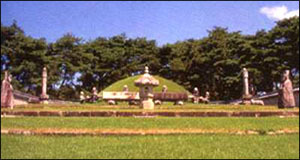 his is the tomb of King Sejong, the 4 th ruler of the Joseon Dynasty, who reigned from 1418~1450 with his queen, Queen Sohun. King Sejong was one of our history's greatest rulers. He is credited with developing the Korean language and for his many inventions, including the udometer and the sundial. King Sejong also conquered the lands to the north to expand the country's territory and reinforced the country's security by conquering Tendo. He also fostered scholars, trained archers and wrote many books, including the Yongbiucheonga and the Nongsajikseol. 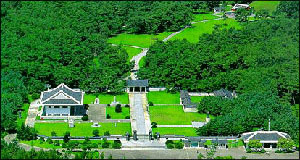 The royal mausoleum is a good representation of the styles of the royal tombs of the Joseon Dynasty. The two headstones show that the king and queen have been buried together, and on the 12 stone pillars surrounding the grave are inscribed 12 zodiac signs). In the center of the mausoleum is an eight-sided hanging lantern. Below the mausoleum is a small house for offering sacrifices to the king and a royal kitchen for preparing the food for the royal sacrifice. Nearby is a house where the guards used to stay and to the east of the sacrificial house, tomb stones have been erected. To the left of the front doors, you will find various scientific tools, including the udometer and sundial, and in the Sejong Hall, you will find relics and information on King Sejong.